Though the trip didn’t perhaps go quite as smoothly as might have been hoped, a good time was had by all. The BSA camping weekend at Stephen Dunne’s rambling farm in central France earlier this year was too good an opportunity to miss. Stephen had started running the weekends four years previously, but this one was significant. It would hopefully mark the resurrection of aFrench BSA Owners’ Club. 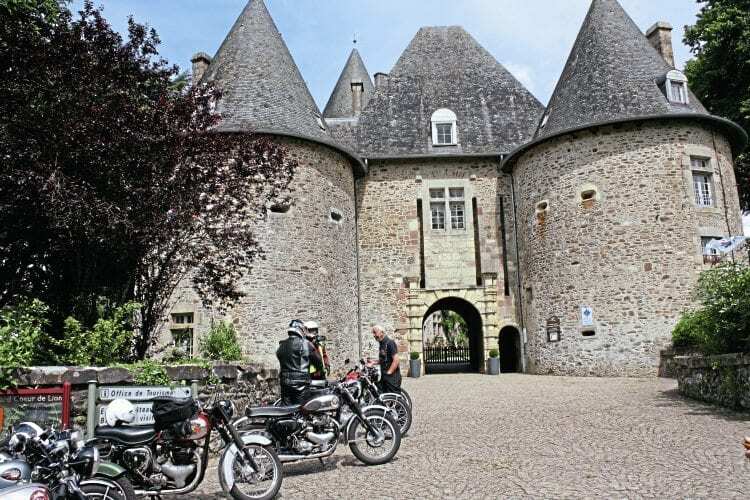 Ride-out destination: the Chateau at Arnac Pompadour. Brian Pollitt lives there. Well, not in the Chateau. The club in France had lapsed, and there was only an internet forum, Amicale BSA. Now Stephen had been joined in the area by Brian Pollitt, known in BSA circles as the former proprietor of the well-rated Lightning Spares, and who with wife Chris had retired to France last year. Together Brian and Stephen plan to relaunch the branch. In April I had enjoyed Brittany Ferries’ sailing from Portsmouth to Spain, and had ridden my A10, Anneka, up from Bilbao to a rented gite in Aquitaine, south-east of Bordeaux. The rally was in the Correze, south of Limoges and north of the Dordogne, so about 170 miles away. What could possibly go wrong? After I’d filled up at Portsmouth, on the ferry Anneka revealed a split at the top front edge of her petrol tank. There were no recriminations – the deck crew provided ample absorbent clothes and the petrol stream soon ceased, and when we arrived and the A10 wouldn’t start, a helpful and beefy crew member ‘persuaded’ it with a couple of massive kicks. Since the split only involved losing the approximately third gallon north of the tank’s internal ‘saddle,’ this could be lived with.